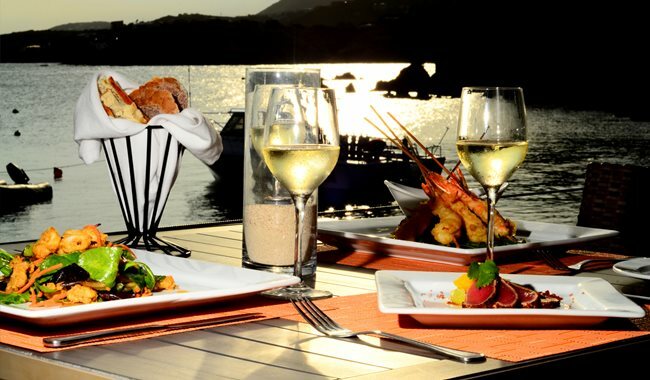 The Sunset Grille is the restaurant at Secret Harbour Beach Resort in St. Thomas, an open-air restaurant located right on the beach. As the name suggests, it really is a fantastic place to watch the sunset. The view faces west and with sunglasses you will get a bright view of the setting sun over the water. The place is upscale, with dark brown tables that are more interesting than typical outdoor furniture. Some of the tables are set onto short tree trunks, and you sit on dense wicker chairs. At the time we arrived, just after 5pm, there was already a live performer playing soft pop hits on a guitar, who was quite good! Staff told us that every seat was reserved except one, so make your reservation in advance. At the center of the Sunset Grille is a square bar, called the Cruzan Beach Club but essentially part of the same restaurant. A server will light a candle on your table, placed in a beach-themed candle holder with real sand and seashells. More than half the menu is steak. We like it! For an appetizer, get the Lox Deviled Eggs, Caribbean Samosas, Blistered Shishito Peppers, Braised Beef Ravioli, or the Tomato and Mango Salad. 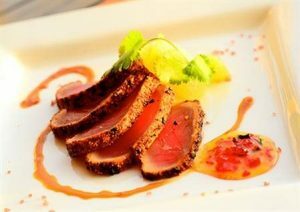 Then for an entree, try the Filet Mignon, Sesame Encrusted Tuna, or 10 oz Skirt Steak, which comes with Puerto Rican rice and beans and a Caribbean steak sauce called chimichurri. We tried a virgin strawberry smoothie, which I believe they called a daiquiri. It was delicious, served in a decorative glass like an alcohol drink. And we got the BBC, Bailey’s, banana, and coconut, which was not as sweet as expected. Both the drinks were a touch too icy, with larger chunks of ice. We ordered the Seared Scallops, which was only two sea scallops, presented on a square, white plate. It was an interesting mix of textures! Its thin onion shavings had been fried, so had just the tiniest crunch. The sea scallop, of course was perfectly smooth, and then there was the base taste of the goat cheese puree. We also sampled the Artisan Cheese Plate. Wow! It came on a tray of metal and wood, served on slab of slate rock that someone had written little names on with chalk. It was so interesting and innovative. We’ve never seen a cheese plate like this. You get to try and discuss the different cheeses by name. It’s exotic, and comes with bread and caperberries (tiny pickles). It was small, as was the Tomato and Mango Salad, which certainly has chunks of tomato and mango in it, but had no sauce and was too basic, requiring a creative twist. The 14oz Ribeye is served decoratively on top of green beans and mashed potato on a white rectangular plate. The meat is delicious, requiring no sauce or topping. It is hearty, a fantastic power-up of protein for a weary traveler, but I did have to cut out some fat. It came with fancy butter, and the potatoes seemed to be hand-mashed, which gave them a great texture, and they had been integrated with onion. We tried the “Surf and Turf”, an option to add a 12oz Caribbean Lobster Tail to any meal, and we chose the Braised Short Rib. They come served on two different plates, with the short rib laid down on a bed of cauliflower, drizzled with mushroom pieces. There’s a peppercorn brandy reduction sauce, and the large portion of meat is piled high with shaved asparagus and herbs, with plenty of vegetables. The meat just fell right off of the bone, but one side was almost completely fat, which was unappetizing. The lobster tail was also delicious, served decoratively in its own bowl, and in a cream sauce. It was easy to access the meat in the tail, and it had a satisfying seafood chew to it. 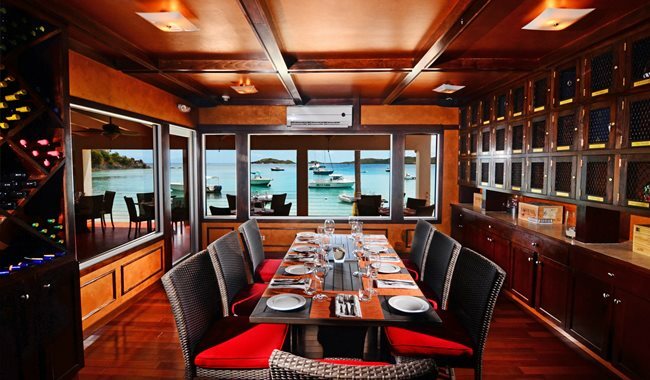 The Sunset Grill has an attractive, upscale decor, a phenomenal ocean view, and a live music schedule. 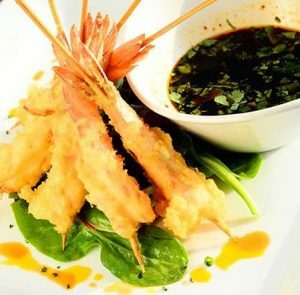 Although the appetizers were too small, its entrees were tasteful and the service was good. 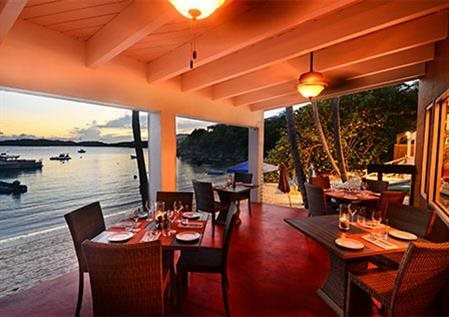 There are many other restaurants with water views on St. Thomas, but 4.5 stars does not quite feel right given the creativity of some of the dishes. I’ll give the Sunset Grille 5 stars.